The Diploma in Culinary Arts is a nine-month programme consisting of three certificates: Basic, Intermediate and Superior. This is the most interesting option for students who want to gain training in the shortest possible time. This programme is taught in English and in Spanish. The length of the course is 30 weeks (608 hours). Usually, students have 3 demonstration sessions and 3 practical sessions of 3 hours each per week. The classes may take place from 8.30 to 21.00. They also have the possibility of taking the Basic Certificate with the intensive schedule and the weekend schedule. Students will obtain a certificate for each of the levels taken and will be awarded the Diploma in Culinary Arts when all three levels are completed. Many students decide not to enrol directly for the Diploma and prefer to start from the Basic Certificate. 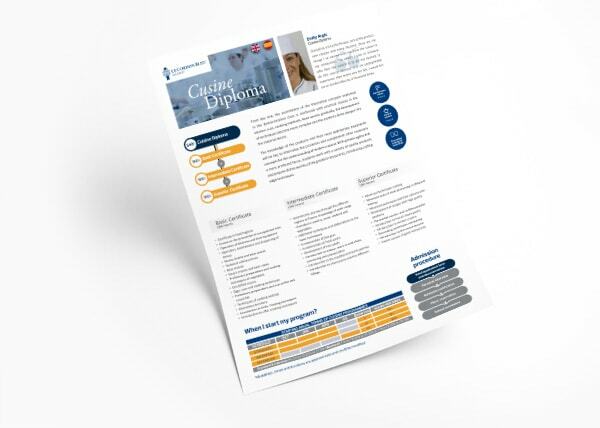 Once it is completed, you may continue with the Intermediate and Superior levels to obtain the Diploma. Each Certificate course has a duration of 180 hours. Gastronomic journey through the different regions of France. Knowledge of wide range of products: poultry, meat, seafood and vegetables.